Dale’s Hat” sounds like a theater production, I think! But I wanted to alert you that I have boxed up Dale’s white fur and sequined hat to return to you. I LOVE that hat, and had so much pleasure from having it in my possession ever since the 2009 memorial service at your house, when you allowed several of us to take with us the hats we wore in honor of Dale. But I am trying to downsize the items in my house, and I think this is one thing that I should part with and return to you. So it’s in a box and ready to take to the post office tomorrow. This alerts you to watch for it. So, I knew what exactly that package contained. 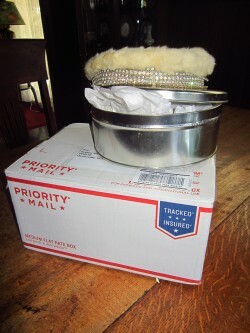 Bit I had no idea that the hat would be nestled in a silver ‘tin box’ of exactly the right size, surrounded with tissue paper and looking as if Susan (or my mom) had just lovingly put it away until the next grand occasion! I do have to laugh… I never expected to see that hat again. Or any of mom’s other hats. I had hung them all up along our porch and asked each of the women to wear one home. I knew I’d never wear them and I hoped some of her friends would. And besides, it was a grand way to do a bit of downsizing of my own! This little fur and sequined number is the only one that has come home, though some of others have kept me in the loop with their shenanigans. 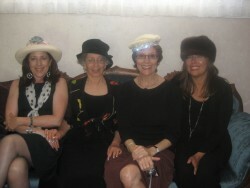 When Bette Snyder wore her bright red picture hat to tea, I received a picture. Ditto when Barbara Christian cleverly used a pink cloche as a flower basket! That hat would look classy on you at the holidays! Hat’s off to you, Sydney, for a charming post today…I do hope you’ll be sporting that chapeaux soon!